5"W Premium Plum Echeveria Permanent Botanical For Fairy Gardens. IT LOOKS AND FEELS SO REAL! 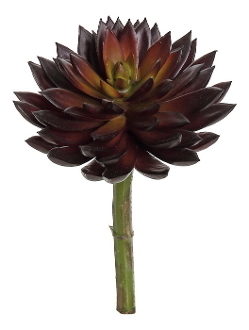 5"W Premium Plum Echeveria Permanent Botanical For Fairy Gardens. Display TIP- Buy several and insert or cut the realistic stem so they are at multiple sizes. Extremely realistic bloom and branch! As a premium botanical, this specimen exudes realistic touch and look without sacrificing quality. This is a great addition for gardens that may have poor growing conditions. Permanent botanicals create a lush environment with no maintenance. Preserved mosses will also ease your maintainence of your miniture garden. We have sourced realistic, scaled appropriate botanicals for your garden.